Thank you for joining me as we count down to the next MFT release. We are seven days away from the big day! All the new Stamps, Die-namics, and Stencils will be available on Tuesday, August 12th at 10:00pm EST. Be sure to check out the MFT Blog to see all the new items being revealed today. Don't forget to leave a comment on the MFT Blog Countdown posts, YOU could win one of the seven $75.00 gift vouchers. I have two cards to share with you today that feature the new Blueprints 18 Die-namics and the Spotlight Sentiments stamp set. I am loving the diagonal cuts you can achieve with this new set of dies! I used two of the digitally provided Blueprints 18 sketches for the inspiration for my cards. 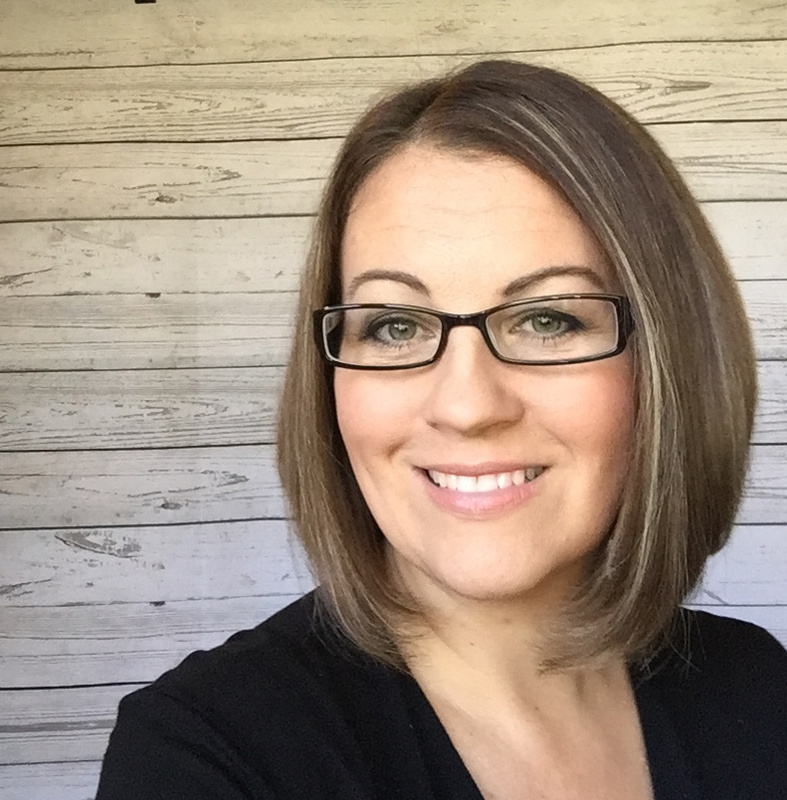 You can download your copy of the sketches from the MFT Blog. 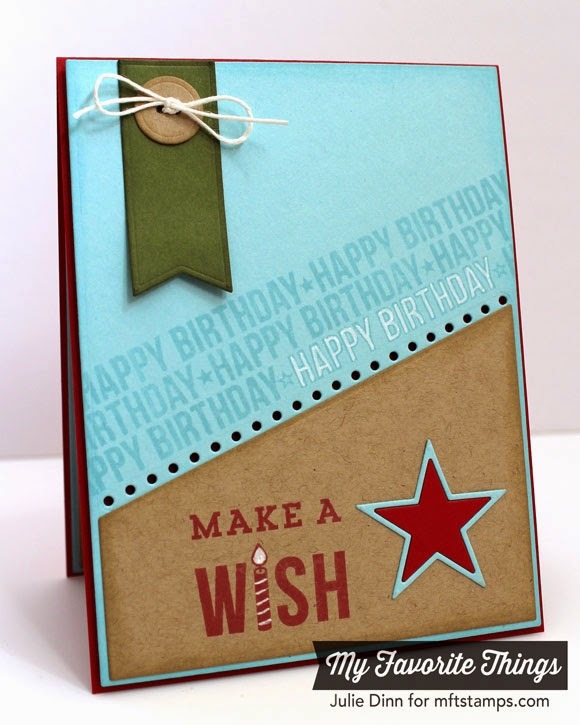 The Spotlight Sentiments are perfectly sized to work with the Blueprints 18 Die-namics. 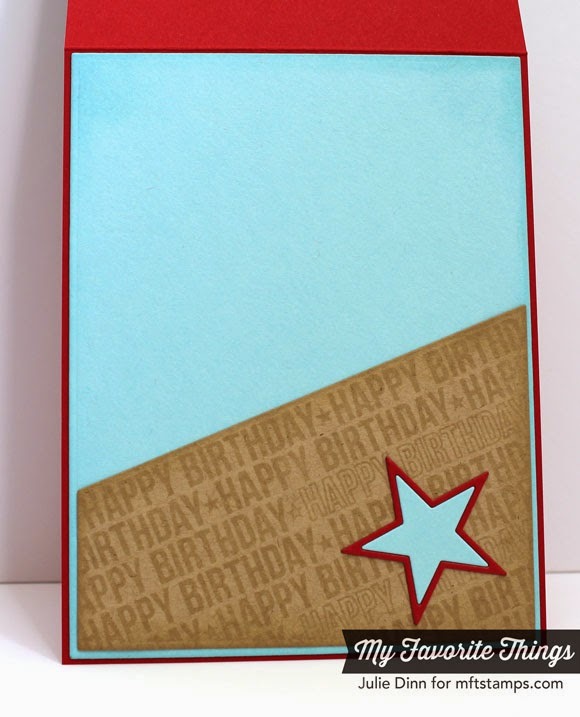 I stamped the Happy Birthday stamp in Berrylicious Ink on Berrylicious card stock. I just love the look of the tone on tone. I used the line of stars to create small peek-a-boo holes for the Kraft card stock to peek through. The background was stamped with the Linen Background stamp in Red Hot Hybrid Ink on Red Hot card stock. The sentiments on the card are from the previously released Delicious Birthday stamp set. 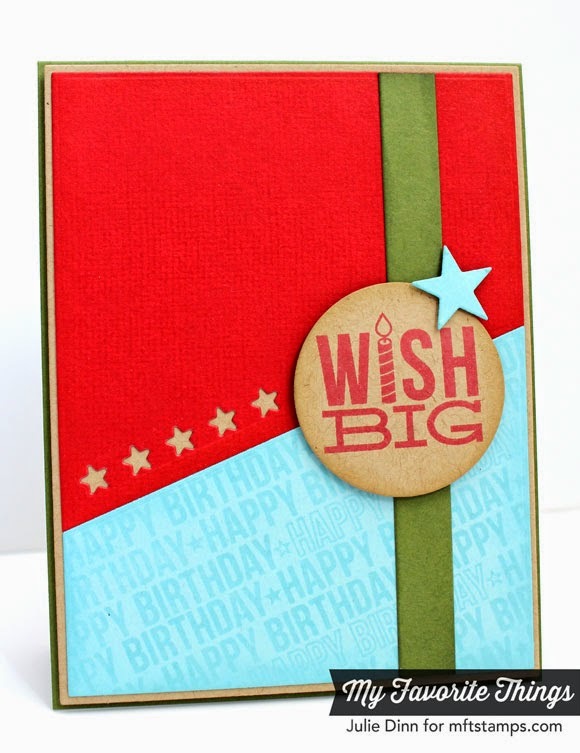 I used the same Berrylicious, Red Hot, and Jellybean Green color combination for my second card. 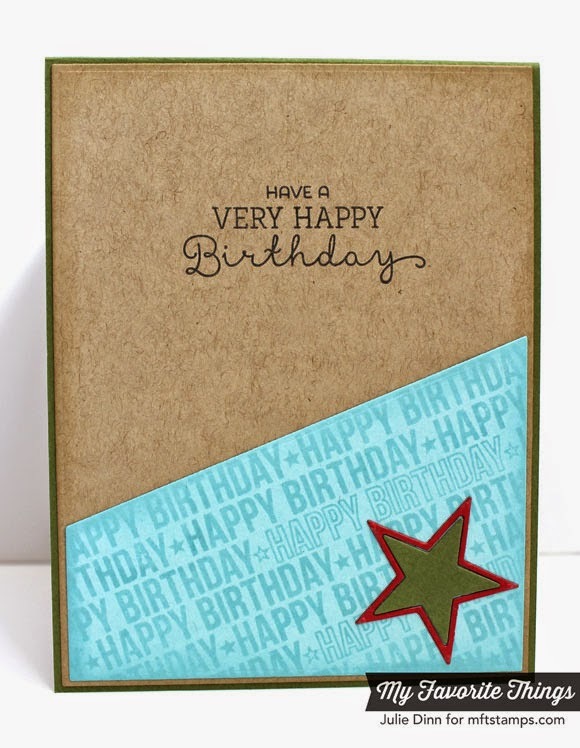 Once again, I stamped the Happy Birthday sentiment on Berrylicious card stock in Berrylicious Hybrid Ink. I highlighted the one Happy Birthday with a white chalk marker. I LOVE that long strip of peek-a-boo circles! I used another sentiment from the Delicious Birthday stamp set on the front of the card. I stamped the sentiment in Red Hot Hybrid Ink and I added a touch of white to it. I love that diagonal piece on the inside of the card. Thanks again for joining me today. 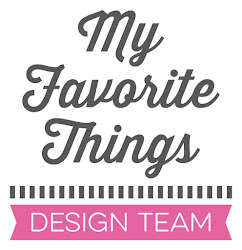 Be sure to check out the MFT Blog to see all the fabulous creations the Design Team has to share with you today. So fun and bright! I love these! Fabulous color choices. Love the new frameworks. Great cards and color choice! Really loving the Spot light Sentiments and the Blueprint Dienamics!! Very cute cards. Great cards! Can't wait to get my hands on this set of blueprints! Great cards. I am loving this peek at the release. Love the cards! Really fresh . . . and love the red card stock and ink. Really a nice red color and good saturation/coverage. I'm loving the new hybrid inks! Pretty cards and colors. Love the new Blueprints des. Nice choice of colors. Love your cards and cant wait to see more from this release. 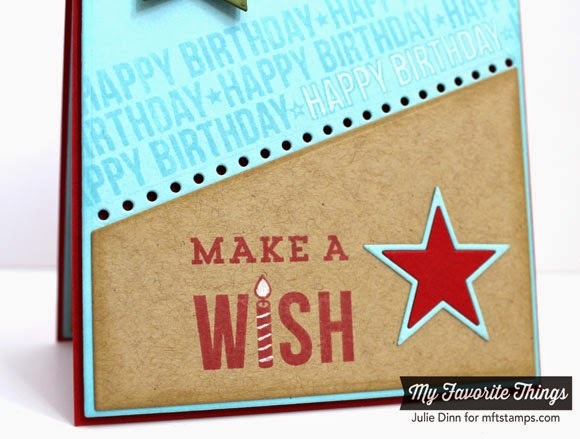 I nearly missed the very subtle Cheesecloth background on your Wish Big card. It certainly gives that look of extra texture that is so needed on cards. Loving the colours! These are awesome!! I'm lovin those blueprints and colors are awesome!! Love the blueprint along with the spotlight set, works so well together! Ready for a Few More Cards? Only Four Days Until the New Release!